If you are looking for a fun way to get back into shape, Muay Thai is one of your best options. Also known as the art of eight limbs, Muay Thai is a striking based martial art that uses eight hard points on the body as weapons and defensive tools: the fists, elbows, legs, and knees. It a unique feature of Muay Thai that separates it from most striking-based martial arts and many view it as the most effective striking-based martial art in the world. Its effectiveness has been proven on battlefields for centuries and it is regularly showcased at tournaments and mixed martial arts competitions. Regular workouts can get boring over time as you find yourself repeating the same exercises over and over again. People who are used to working out regularly might be able to stay motivated and stick to their routines even if they are monotonous, but it is a very hard thing to do when you are trying to get back in shape. You need a fitness routine that will never get boring and Muay Thai does just that. There are literally thousands of moves for you to learn so you never know what to expect when you show up for class. The drills you perform are constantly changing and so are the techniques. Your classes will be the highlight of your day as you eagerly anticipate the new things you will be taught instead of some boring task you have to force yourself to do to get back in shape. If you are like most people, you probably have a very busy schedule and things can get stressful from time to time. Martial arts classes are a great way to lower your stress levels. The drills you perform will make you break a sweat and that sends a signal to your brain to release a hormone called dopamine. It creates a pleasurable sensation in your brain, putting you in a better mood. Since Muay Thai is a striking-based martial art, you also get to punch, kick, elbow and knee things during classes. This helps to release pent up anger and frustration. By the time each class is over, you’ll feel relaxed and happy. Your quest as a martial artist is an individual one and a competent instructor will never push you to train at a pace you are not comfortable with. That means you do not worry about being asked to spar with World Champions during your first week or to overexert yourself during classes. It doesn’t matter if you are only interested in hitting heavy bags or your plans are to compete in the future. Your instructors will monitor you closely and ease you into the classes. You’ll soon be training at the same pace as seasoned students without even realizing it. Training partners make things a lot easier. Muay Thai gyms are full of interesting people and some of them will become your good friends. They will serve as a support system for you during classes and you can share tips and tricks with each other. That is a stark contrast from working out on your own. Sure, you might be able to make things more bearable by listening to music, but it is not the same as working out with a few friends. It is also harder to skip out of workouts when you have training partners/friends to hold you accountable. 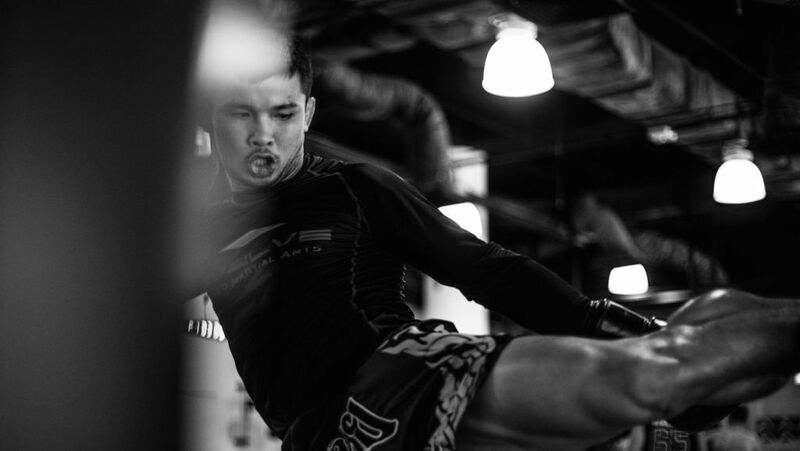 A student trains Muay Thai at Evolve MMA (Far East Square) in Singapore. One of the best things about learning Muay Thai are the many benefits that come with training. Teaching you how to effectively defend yourself is one of those benefits. The art of eight limbs is not known for fancy techniques. You learn practical techniques that can be used in self-defense situations if necessary. It is the little things like this that make learning Muay Thai a great way to get back in shape. You don’t just improve your fitness, you also learn many cool things that can come in handy someday. Some martial arts are more efficient than others when it comes to how fit lifelong practitioners are and Muay Thai is one of them. Try finding an active life-long Muay Thai student that is out of shape. They simply do not exist. 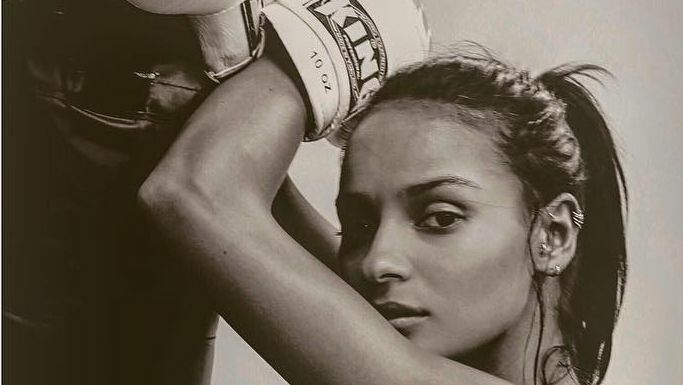 Muay Thai gives you a full-body workout. It works every muscle in your body, particularly your core ones, and students can burn upwards of 1,000 calories every hour they spend training. It doesn’t take much dieting to be lean and fit when you regularly engage in an activity that burns that many calories. Supplementing Muay Thai with other workouts is optional. Muay Thai on its own will get you in the best shape of your life. The friendships made in the Muay Thai gym are invaluable. It is easy to assume the benefits of learning Muay Thai are only physical, but that couldn’t be further from the truth. Learning Muay Thai is a life-changing experience that will strengthen your mind as much as it strengthens your body. Everyone starts as a beginner when they start learning Muay Thai, but, with time, you will master many things that you once struggled with. It teaches you how important consistency and perseverance are. Your progression also teaches you the importance of being disciplined and working hard towards a goal. Most importantly, Muay Thai teaches you how to observe the world around you and react to things in an intelligent way. Each technique has its strengths and weaknesses. Being a good Muay Thai practitioner is about figuring out the best time to execute a particular technique. Never let the fear of learning something new hold you back from experiencing the many ways Muay Thai can help you get back in shape and enrich your life. Find a good Muay Thai gym and train consistently. You’ll start noticing changes in as little as a few weeks. If Muay Thai sounds like the workout you’ve been looking for, try out a class!